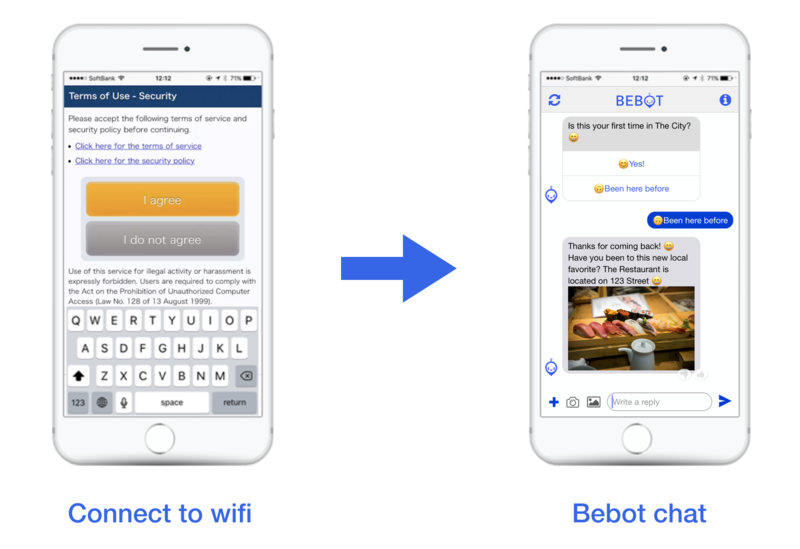 Collect valuable consumer insights with ease by changing your business's wifi redirect to Bespoke's Bebot chatbot. TOKYO, February 6, 2019	(Newswire.com) - Bespoke Inc. ("Bespoke") is pleased to announce the addition of a new feature, "Consumer Connect for Bebot" to their already popular Artificial Intelligence (AI) chatbot concierge service "Bebot." Strategic partnerships with the Bebot AI will help connect businesses to their customers by personalizing communication to better understand customer preferences. Bebot's new feature will now help any business to run surveys or promotions through the chat interface. 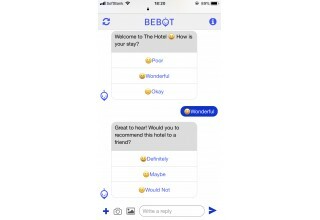 Being a non-intrusive way to interact with customers, businesses can use Bebot's AI technology to gather customer insights to help enhance customer experiences at each establishment. 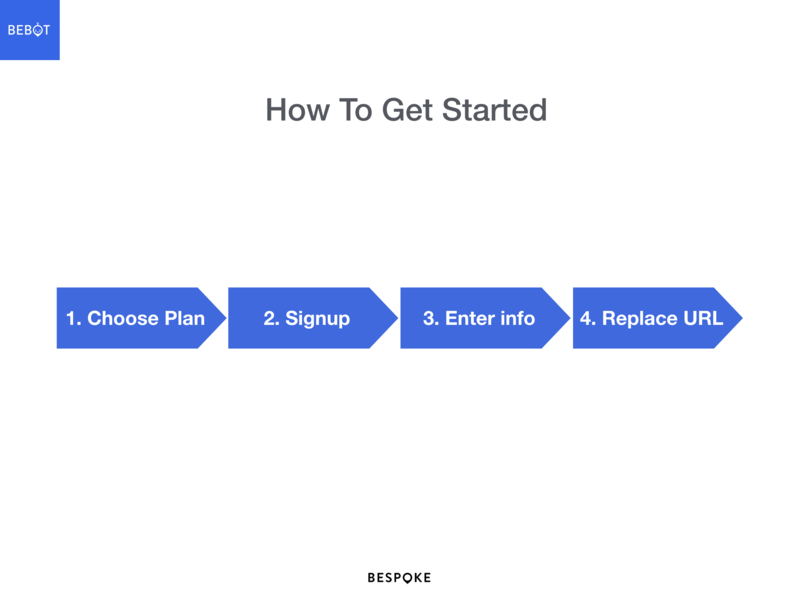 After a straightforward onboarding to the service in as little as 15 minutes, your business is ready to begin collecting insights. 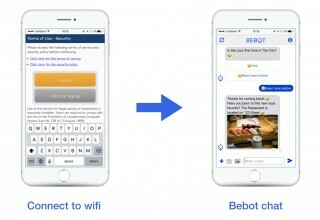 Customers are guided to Bebot after completing the wifi authentication pages from connecting their devices to the internet. Instead of seeing the business's website, which is often ignored by customers already in the store, users are redirected into a Bebot chat window. From first-time visitors to loyal customers, each user is provided with specialized assistance by Bebot. 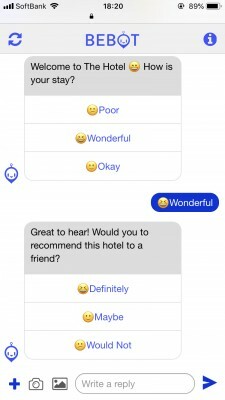 Guests can offer feedback through the chatbot so each business can improve their services based on popular customer opinions. Businesses also have the opportunity of promoting new products or services through the chat. To get started, simply to choose a plan, sign up with the Bebot service, enter the information to display to customers, and replace the wifi redirect URL. Businesses can choose from three different plans, giving the ability to select the plan that best suits their needs and budget. Proven to be successful at busy tourist destinations with foreign travelers, Bebot is available 24/7 to simplify traveler experiences. With Consumer Connect for Bebot, businesses now have the chance to develop alongside the technology to provide their customers with unique experiences for unforgettable visits. First launched in 2017, Bebot already provides AI-powered concierge services in hotels globally and launched its Narita International Airport service in November 2017 and its Tokyo Station service in March 2018, as well as Kyoto City in January 2019. Users can ask specific questions related to their travel plans by chat and receive tips, directions and reviews without leaving the chat screen. Tokyo-based Bespoke Inc. is a leading developer of Artificial Intelligence (AI) technology dedicated to multilingual guest services through easy access to information, local recommendations, and solutions. Its products include Bebot, the internationally-popular AI concierge and LEVART travel community, focused on personalized customer service. 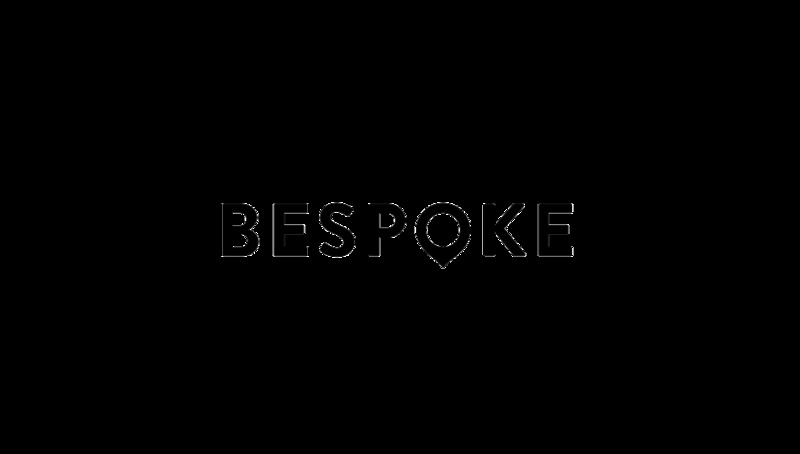 Bespoke Inc. has developed AI technology for well-established clients serving users from over 100 countries, such as Holiday Inn, Sofitel Hotels & Resorts, Narita International Airport. Founded in 2015 in Tokyo, Bespoke Inc. is dedicated to enabling amazing local experiences to hotel guests through data and artificial intelligence. Current products include Bebot, the AI concierge, and LEVART travel community. Marketing & PR, Bespoke Inc. The Bebot chatbot provides personal AI assistance to passengers on board the Izu Craile train and at 8 additional stations. New Bebot concierge modernizes rural Japan for foreign visitors. No more 'Lost in Translation'? The Hotel New Otani is now also set to become home to Bebot AI Chat.